Why did the CCS Hawkeyes varsity basketball team come to mind? One, because they just claimed the first-ever state championship in a highly competitive sport. Not everyone plays golf, or even football. But it’s the rare American boy who hasn’t spent many an hour playing pickup basketball, dribbling and shooting and, from time to time, spraining an ankle. But, two, because this Hawkeyes basketball team stuck to business, stayed cool when challenges arose, worked hard on their skills, and supported each other on the court the way the best teams do. They didn’t face the challenge of defeat too often this year, but many of the eight veteran seniors – tri-captains Jack Lambert, Noah Lifgren and Calvin Sandler, plus Ryan Burns, Jesse Furnari, Kyle Meyer, Kyle Santello and Ben Tafuro – had suffered disappointments in past seasons. In victory, the guys – they included sophomores John “Big Man” Kennedy and Spencer Lewis, and high-jumping junior Ryan Lansing – had a lot of class too. 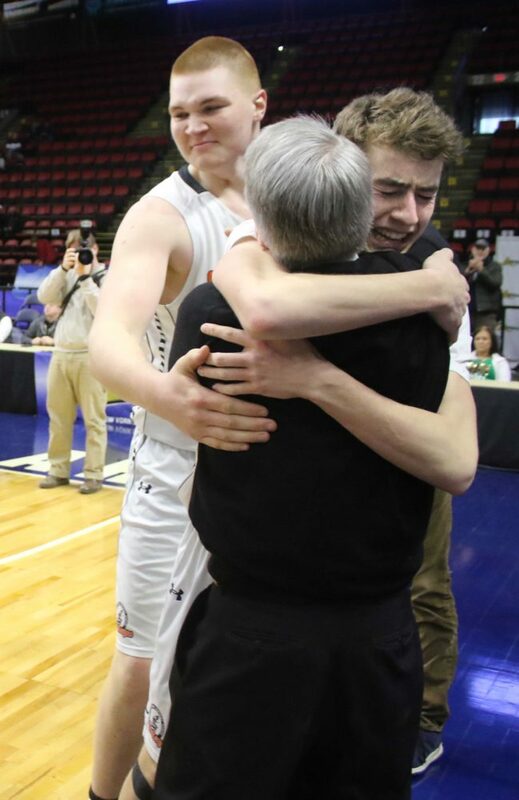 And what an experience for Head Coach John Lambert, coaching his son to a state title within a year of the passing of his father, retired superintendent (and former coach) Paul Lambert, who had run drills with his now-judge son in a run-up to the state tournament in the 1990s. A very rich experience, and very rich for fans, too. Fandom has its own rewards. Following a winning team connects with a continuum of traditions and connections with their hometown. The cheering hundreds in around the flagpole as the Hawkeye Heroes rode into town on the will never forget the pride and exhilaration that will buoy them in the years ahead.